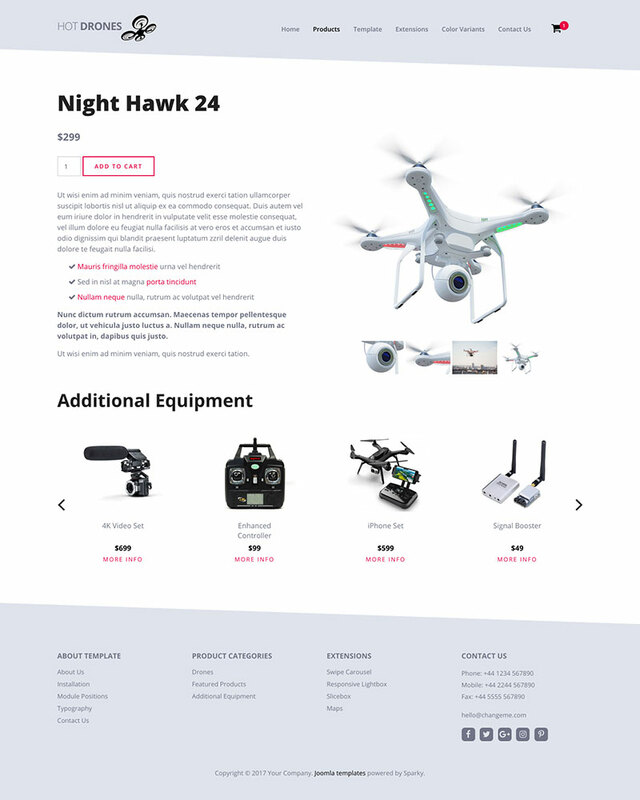 Hot Drones is a responsive Joomla template with e-commerce features, powered by J2Store component. This component unbelievably easy adds all necessary e-commerce features to your site and integrates with it seamlessly. 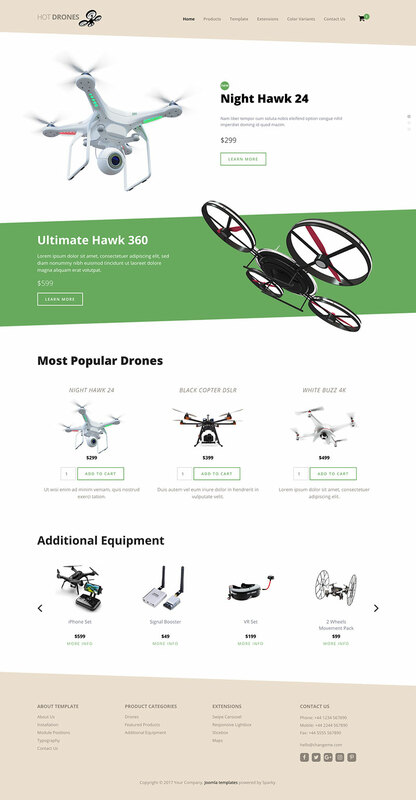 Hot Drones template is based on a clean design and puts your products in the main focus. Actually, this template can be used even on sites that don't sell anything. Unlike VirtueMart, J2Store is completely integrated with core Joomla articles. You are just one click away from switching any Joomla article to a product page and vice versa. Once you switch your article into the product page, you can easily add other necessary product parameters, such as price, images, dimensions, variables (like size or color), etc. In the Hot Drones template demo, we (obviously) sell drones. Several main products are available in the main category. Each product can be accessed from the big responsive and touch friendly carousel. Beside that, there are one or more featured products. This category will be usually filled with products that are best sellers or currently on promotion. 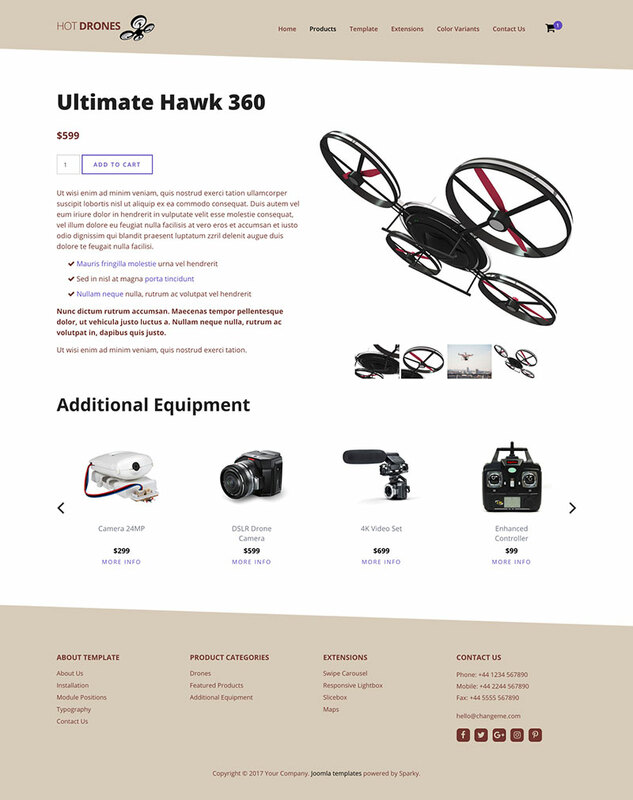 Another category of products are filled with equipment for drones. Regardless of the product you are selling, there are usually smaller, supporting products to the main products. Products from this category are also presented in the second, smaller instance of the carousel module. We mentioned the categories of products. It's worth to mention again that J2Store integrates with Joomla perfectly, so as you might expect, these product categories are just Joomla categories of articles. If your site doesn't need e-commerce features, these product categories can easily become categories of your articles and blog posts. 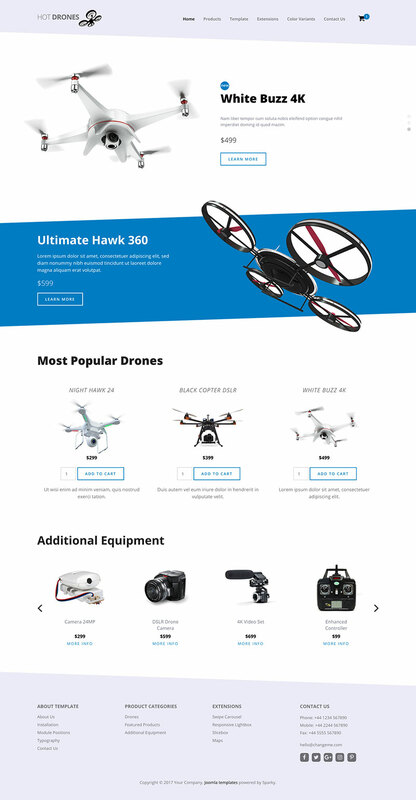 E-commerce features powered by J2Store component (free version). Total control of all menus through the framework. You can set functionalities and style of all your menus and drop them directly into the layout. 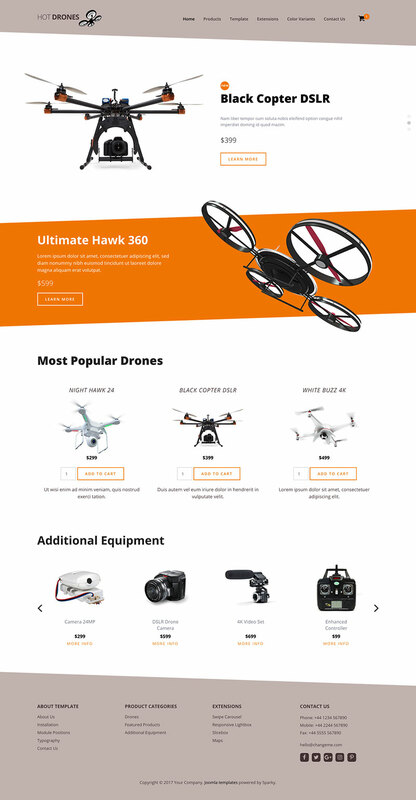 The Hot Drones template uses drop-down menu which allows multiple levels of menu items to be included in drop-down panes. Responsive Joomla modules included with this template: Hot Swipe Carousel (retina ready), Hot Slicebox, Hot Responsive Lightbox and Hot Maps module. All these modules are included with this template without additional fees (you save $15 per commercial module).